The home was recently featured on CBS 12’s Mansion of the Week, a weekly segment detailing mansions for sale. 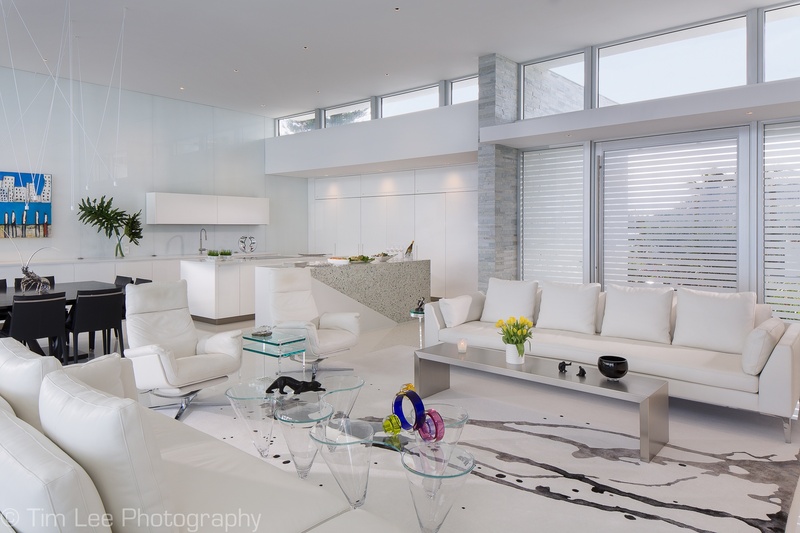 Throughout the home there is a brilliant use of the color white, with hints of gray and aqua for a clean, coastal look. Bold, bright colors pop through art work and décor. But the kitchen is the closest to the ocean you will get. From the reversed painted glass that reflects the ocean onto the wall, to the island made with Vetrazzo recycled sea glass slabs, this space is as beachy as they come. For the kitchen, the homeowners went for minimalist and pristine. Preferring the space to be clutter-free, they wanted everything tucked away and hidden. Sub-Zeros are one of the chic appliances hiding behind the vertical cabinets. With Wolf ovens, a Gaggenau cooktop, and Mia Cucina high gloss lacquer resin cabinets, the space is stylish and sophisticated. The back wall in the kitchen has reversed painted glass that matches the color of the cabinetry (it comes off a bit green because of iron in the glass). When you’re in the space you actually see the reflection of the ocean on the wall. 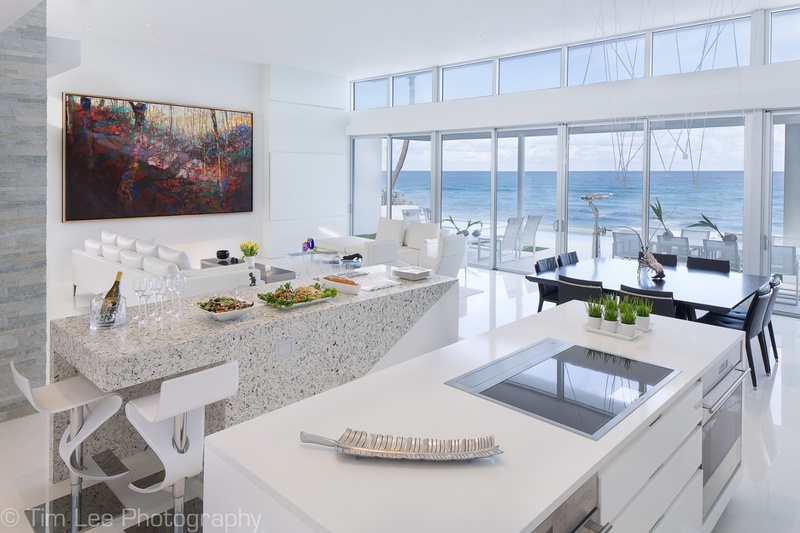 How incredible to feel like you are surrounded by the ocean in your kitchen. But what really captures the seaside experience in this living space is the Vetrazzo Palladian Grey island. 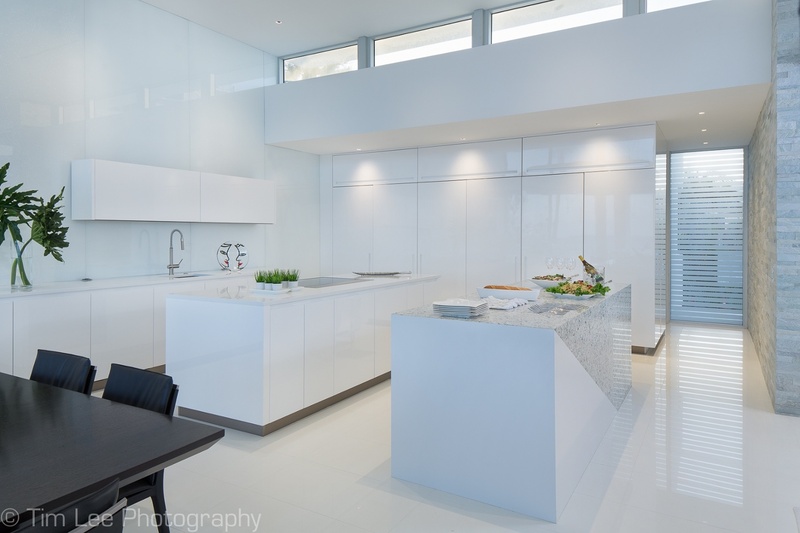 The aqua, white and gray sea glass complete this kitchen design. The island has a unique, abstract design with the blending of materials. The design concept was the creation of a stacked monolithic segmented block of two triangulated wedges of contrasting materials. Vetrazzo was chosen for its granular aqua glass infusion that’s reminiscent of sea glass, which is just steps out of the door. The other material used is a full sheet, seamless, large format porcelain tile. The counter stool area was cut out of the wedge. The bar stools are Powell & Bonnell. What attracted the adventurous homeowners to Vetrazzo’s Palladian Gray was mainly the color and uniqueness. Most of all, the material was practical because the sea glass fit in with the coastal theme and design parameters. The distinctive, subtle tones of Palladian Gray are inspired by the traditional arched Palladian windows that grace so many fine historical buildings. A striking mix of architectural glass that pays tribute to the legendary father of Renaissance architecture, Palladio. The interior designer H. Allen Holmes has used Vetrazzo before for other projects, so he was familiar with the material, distributed by UMI United Materials Inc and said the fabricators Accurate Tile & Marble did exceptional work. This ultra-modern project is a good example of the versatilty of the recycled glass surface for coastal kitchens of all styles from retro to country to beachy. Colorful, but neutral in style the countertops can support any design with the addition of more taste specific elements like lighting and appliances. 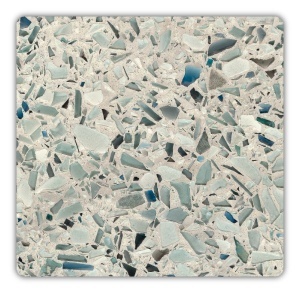 Is recycled glass right for your next coastal project?  Download the Vetrazzo Endless Summer Inspiration Gallery.